TP-LINK’s T2700G-28TQ is an L2+ managed switch designed to build a highly accessible, scalable, and robust network. 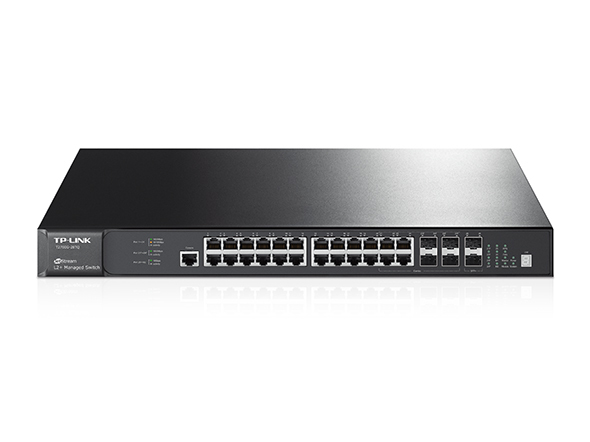 The switch is equipped with 24 Gigabit RJ-45 ports, 4 Combo Gigabit SFP and up to 4 10Gbps SFP slots, giving network administrator great network flexibility. It supports basic Layer3 features like static routing and RIP v1/v2 by default and can be upgraded to support abundant Layer 3 features such OSPF/ECMP/PIM/VRRP with the addition of a Layer3 license. What’s more, with physical stacking feature and optional redundant external power unit, T2700G-28TQ provides a robust network with efficient redundancy. T2700G-28TQ provides robust security to help secure your enterprise network. TP-LINK’s T2700G-28TQ L2+ managed switch provides a reliable and cost-effective solution for enterprise, campus and ISP networks.